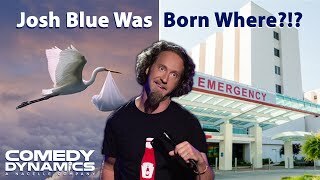 Perhaps best known as the comedian who puts the cerebral in Cerebral Palsy, Josh Blue centers much of his self-deprecating act around his disability. He exploded onto the national comedy scene by capturing the attention and endearment of the country as the winner of NBC’s Last Comic Standing. Having already established himself as one of the most sought after comedians on the college circuit, his weekly appearances on Last Comic expanded his fan base exponentially. Josh starred in Comedy Central Presents: Josh Blue, which received rave reviews from fans and critics alike and was named the 11th best special on the network in 2011. Josh debuted a one-hour special on Showtime, Sticky Change, where he tells stories about everything from being a white African-American, to dealing with cabbies who think he'll pay in sticky change. In 2016, Josh released his third one-hour special, DELETE, available on HULU and Amazon, in which he explains why you shouldn’t call disabled people “inspirational”. He has appeared twice on Ron White’s Comedy Salute to the Troops on CMT and made his late night television debut on The Late Late Show with Craig Ferguson. He has most recently appeared on The Tonight Show starring Jimmy Fallon on NBC. Possessed with an undeniable likeability and impeccable comedic timing; Josh continues to break down stereotypes of people with disabilities one laugh at a time. His stand-up routine is in a constant state of evolution and his off-the-cuff improvisational skills guarantee that no two shows are exactly alike. Josh made his television debut on Comedy Central’s Mind of Mencia. His story has been featured on Fox, CBS, ABC, and MSNBC. He was the first comedian to perform stand-up on The Ellen DeGeneres Show, was named Best Winning Reality Show Guest for his appearance on Live with Regis and Kelly, and made a standout appearance on Comics Unleashed. He became the first comic to debut a stand-up special on the big screen when his first one-hour special, 7 More Days in the Tank was shown in movie theatres across the country. Portions of the performance also aired on Bravo Network as a half-hour comedy special. Josh is a repeat guest on such nationally syndicated radio programs as NPR’s Talk of the Nation and The Mancow Show and has been featured in numerous print publications including People Magazine and The New York Times. Josh was a member of the US Paralympic Soccer Team that competed in Athens at the Paralympic Games, the world’s second largest sporting event. He is a single father living in Denver, CO with his son, Simon and his daughter, Seika.